We have been making lots of Valentines themed arts and crafts lately. This one is so simple but came out looking so pretty and effective, we were really pleased with the result. Even the youngest toddlers would be able to help make one of these. It’s a fun process art project, and if you have a fairly large canvas then it can easily be a collaborative project too. To get started, the children mixed their own paint in Valentines or love themed colours, using red and white, similar to the paint they made for our Valentines mirror painting project. After mixing a colour that they were happy with, they added lots of fine glitter in gold and mixed it all into the paint. 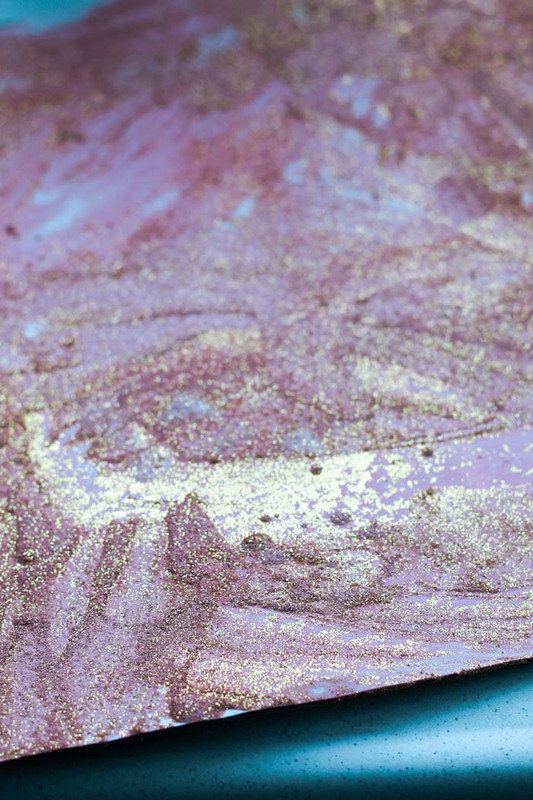 This gives some lovely texture and shine to the paint. You can also paint and then sprinkle glitter all over the finished canvas if you prefer – both ways look great! Since the paint is textured and shiny, it looks so pretty however the children cover the canvas. The random brush strokes just add to the effect, and as I mentioned it works well for a couple of children to do together. My 5 and 3 year old both helped with this one, working together to cover the whole space. Once the paint has dried, it looks pretty even just as it is but we decided to add some shiny letters to compliment the theme. 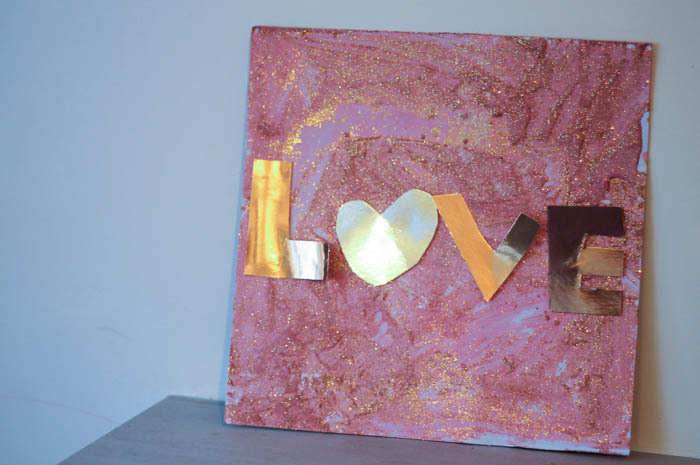 We used gold card to cut out “Love” with a heart for the O but you could put whatever you like, “mum” or “dad” if children are making as a gift for parents, or their own name would work nicely too. Pva glue was not working well with the textured canvas – it just was not strong enough. Hot glue may do the job, but we ended up just using double sided tape to stick down the letters. Sticky pads would do the same job too, and like the tape they will lift the letters a bit, adding even more texture and depth. Very simple and easy with great results. I’m sure we will mix this up with different colours for different seasons. Coincidentally, I saw something similar at My Nearest and Dearest, where her 4 year old made a night sky themed process art canvas which I love! I’ve teamed up with some fabulous friends to bring you even more ideas to make Valentine’s Day 2015 extra special! 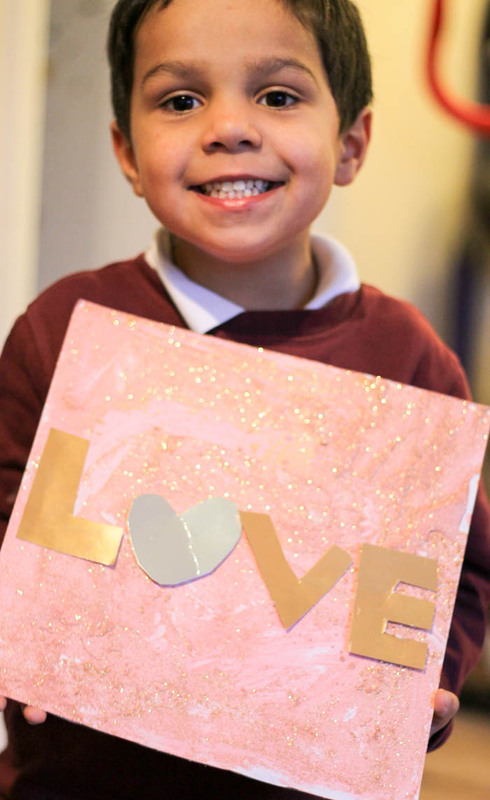 Valentines for Boys – If your boy hates Valentine’s because it’s all pink and full of hearts you might just change his mind with these FREE printables that Sheila and her son have put together. Valentine’s Day Science Fun – And let’s finish up with some Valentine’s Day science over at Colleen’s place! Your boys are just ADORABLE! I love this because it would make a great gift and would be hung on the wall with pride! Aw, what a great gift! Thank you for linking up to the Bloggers Brags Pinterest Party. I have pinned your post to the Bloggers Brags Pinterest Board. 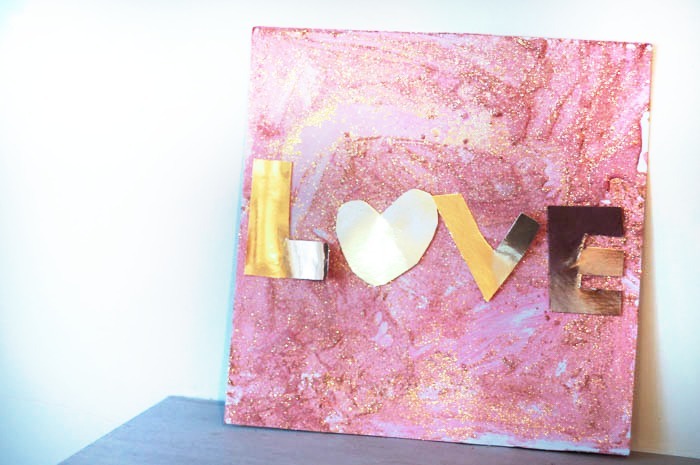 What a beautiful project for Valentine’s Day! 40 Preschool Valentines Activities- Make Learning fun!